MHS senior Skylar Podvey interns at Compass Real Estate for the Career Internship Program. Podvey doing work for her internship. Photo courtesy of Podvey. Skylar Podvey does more than the average teenager between her many sports and alternating high schools. 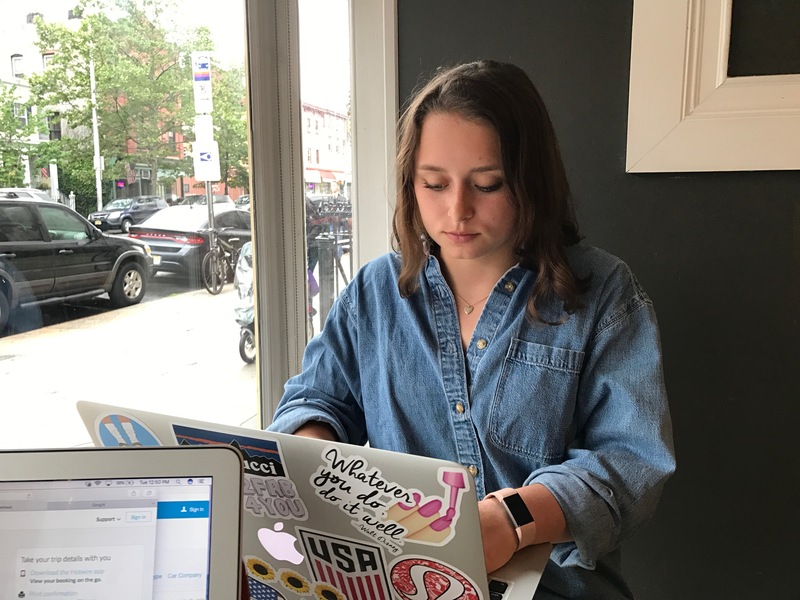 The Montclair High School and North American Hockey Academy (NAHA) senior has recently interned with Compass Real Estate. The Career Internship Program at Montclair High School allows seniors who qualify to spend four weeks at the internship of their choice. At Compass Real Estate, Podvey helps organize, market, and advertise for the real estate company. She also is helping her mentor get a start in creating her own TV show. Throughout her experience she has learned to use different software such as Mailchimp and Keynote. One or two days a week she commutes to Brooklyn and works at the real estate office where she writes emails and reaches out to people, especially about the company’s new and upcoming June newsletter. While on the other days of the week, she goes and meets with her team at coffee shops to discuss future plans for the company. In high school, Podvey has split her time between two schools, NAHA, a hockey academy in Vermont, and Montclair High School. From late September to early March, Podvey has spent her high school years being assistant captain of the elite women’s hockey team where she helped lead her team to multiple victories, including the Junior Women’s Hockey League, the Toronto Aeros Tournament, and the Northwood Invitational Hockey Tournament in Lake Placid. Podvey was also named Defensive Player of the Year and First Team All Star for her success with the North American Hockey Academy White Team. At Montclair High School, Podvey was apart of the Girl’s Lacrosse program for three years, earning a starting spot on the varsity team her junior year. This upcoming fall, Podvey will be attending St. Lawrence University in Canton, New York, where she will be playing on their Division 1 Women’s Hockey team and furthering her love for the sport. As of right now, she will be majoring in Psychology and possibly minoring in marketing, thanks to her experience with the MHS Career Internship Program.